Four major financial statements are required for external reports, which are an income statement (statement of comprehensive income), a statement of owner’s equity (statement of changes in equity), a Balance Sheet (statement of financial position) and a cash flow statement (statement of cash flows). The cash flow statement may be presented using either a “direct” method or an “indirect” method. The only difference between the direct and indirect methods of presentation concerns the reporting of operating activities; the investing and financing activity sections would be identical under each method. The cash flow statement is usually divided into three sections: Operating, Investing and Financing activities. Add non-cash expenses, such as depreciation, amortization and depletion that are already included in net income. Less non-cash gains, such as gain on sale of assets. Add or Less changes in working capital excluding short term borrowing (not payable and like nature) and cash equivalents (cash in hand, cash at bank and marketable securities). Working capital is current assets and current liabilities. UMAR FAROOQ Company’s current asset and liability balances for the past two years are as follows. Net income for the year was Rs. 120,000 and depreciation expense was Rs. 15,000. Required: You are require to prepare operating activities section of cash flow statement? 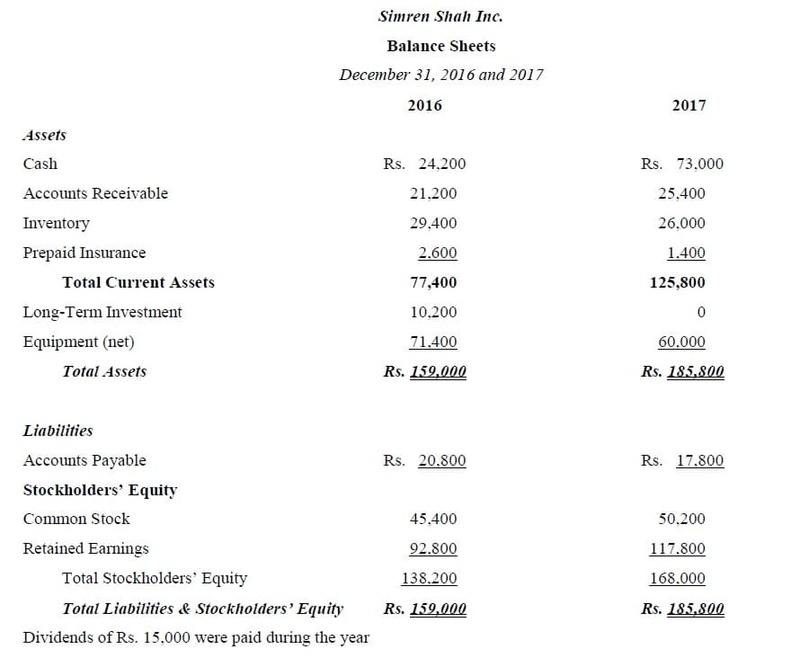 Zainab Iftikhar Corporation’s current asset and liability balances for the past two years are as follows. Net income for the year was Rs. 150,000, depreciation expense was Rs. 22,000, and gain on sale of land was Rs. 28,000. Required: Using the indirect method, prepare the cash flows provided by operating activities section of the statement of cash flows. Financing activities involve cash flow of short term borrowing (not payable and like nature), long term liabilities shareholder’s equity and dividend. Required: Prepare the financing section of the statement of cash flows. We can check prepared cash flow statement with the help of cash and cash equals. Last year Cash Equals + Changes in Cash Equals = Current year Cash Equals. >>> Practice Cash Flow Statement Quiz 1 and Quiz 2.